If you have not yet decided what to wear on a Christmas party and you have no time to shop then don't panic. Here's what I wore for my Christmas party. I didn't shop for it, just used whatever I had in my wardrobe. The word Christmas reminds me mainly of red, green and white colors. Most of the parties usually use these colors for their themes as well. So let's create a look with the same festive colors. For this, start searching your wardrobe for everything you could possibly find in these colors. Take out that old red top, white dress or green pants that you never wore before. Don't forget to pull out the important accessories red, green or white shoes, belts and jewelry. Choose a dress from one of the three colors and accessories with the rest. I chose a white dress which I wore last year for Halloween. I used red and green to accessorize. Simple key is don't use white again to accessorize, instead use the other two colors. I also wore a reindeer hair band, which is missing in the above picture. You could wear any head piece you like, also gloves or hand cuffs will look great. Colored fish net stockings or knee high boots look chic. I hope this post was helpful. I wish you all AWESOME people a happy and Merry Christmas. If you wish to see how I styled this same dress for a scary Halloween look then check out this Seattle Halloween 2014 post ! 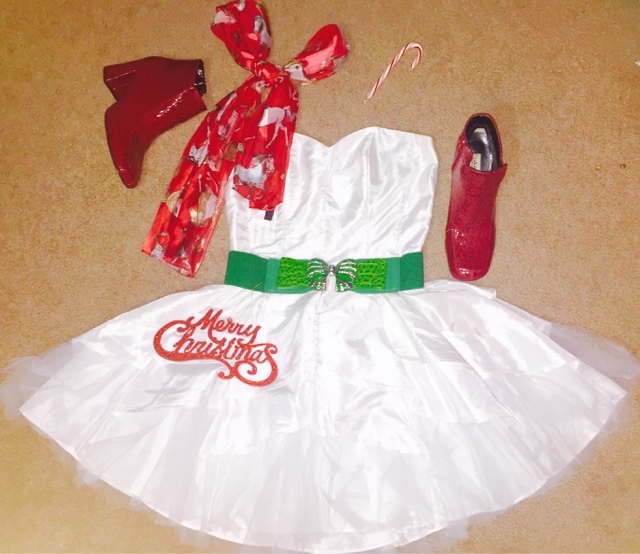 Merry Christmas！Cute dresses！Have a nice party!